The Coal Mine is an award-winning, popular exhibit that was built with help from scenic artists working in the movie industry. 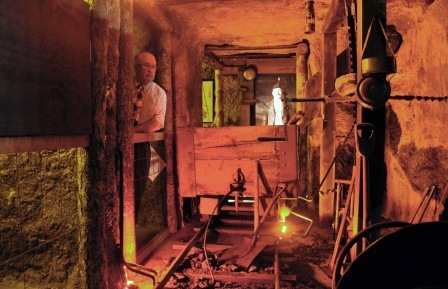 The coal mine shaft is as close to an actual mine as most people will ever get. Besides having the look and ambiance of an underground shaft, there is also an interesting geology component, as well as some interactive displays. Using the attached brass coal miners tag in the display near the end of the exhibit, you can hear different stories about actual people who worked in the local mines. Nanaimo’s coal deposits were the first known large deposits on the west coast of the Americas and the type of coal was ideal for steam production. The first ship to be loaded with coal was the Cadboro in September 1852. Over the next 100 years, coal mining in Nanaimo provided steady employment. In search of a better life, men and women travelled from many countries to start anew in Nanaimo. Some of these countries included England, Scotland, Croatia, Finland, Italy, and China. Each and every day, men would descend in steel cages hundreds of meters below Nanaimo to mine “black diamonds.” It was tough and dangerous work. Men would drill, blast, and then shovel coal and rock into waiting carts hauled by mules. After the coal was cleaned and sorted, it was shipped out to Vancouver, San Francisco, Victoria, Chile, Hawaii, and Alaska. In the 1920s, coal production declined as industry turned to petroleum. Accidents, strikes, and layoffs were commonplace in the lives of Nanaimo miners. Although advancements in equipment and safety procedures did reduce the number of serious accidents, it did not eliminate them. During its time as Nanaimo’s key industry, coal mining produced over 50 million tons of coal. There are still extensive coal deposits under the city today.